Doesn’t this just look like a giant green apply Jolly Rancher? 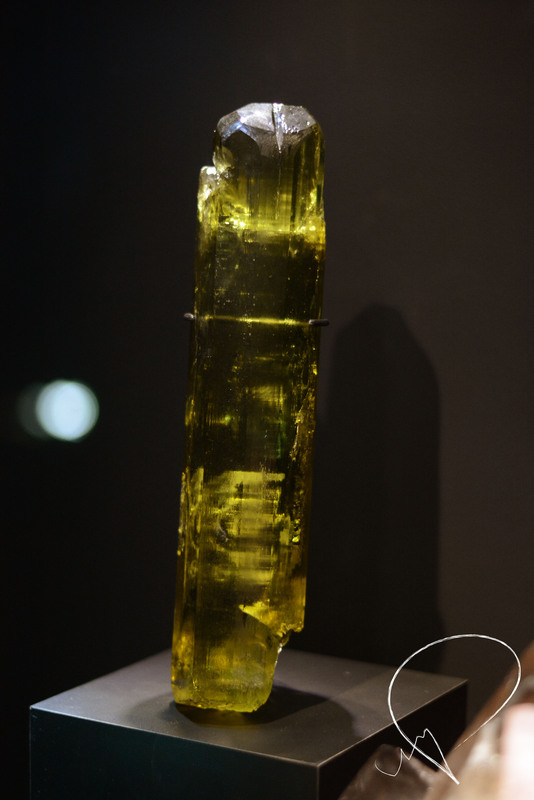 I think it was a peridot specimen. But again, I wasn’t paying attention to the info. Freshly watered plants always look pretty, don’t you think? Building little terrariums and little gardens is really fulfilling. I don’t know why, but it is. Maybe it’s because you’re building life, a little ecosystem, that depends on you for irrigation, maintenance, survival. Either way, despite the depressing snowy weather (because after Christmas, snow is depressing, let’s face it) my local Meijer is already selling potted spring plants like tulips and hyacinths. While I was doing some quick shopping earlier this week, I couldn’t pass up the opportunity to get my own potted hyacinth and stick it in a glass bowl. Best. Decision. All. Week. My room smells SO fresh and fragrant and the flowers are blooming very nicely. I didn’t add any extra potting soil, only added a layer of moss on top. This photo has been sitting in my files for 2 months waiting to be published. I’ve been on a smoothie kick again. A kale smoothie kick, to be specific. For whatever reason, green smoothies get me super excited – because they’re green. I think this was the first one I achieved to this degree of gorgeous green. So of course I took a picture.